The traditional ways that trading partners communicate business information -- by phone and email -- is manual and costly. Systems Integration makes the communications automatic for a more efficient supply chain. Hello and welcome to the latest webinar from Essent. Today we’re going to show you a how Systems Integration makes business communications automatic, efficient, and hassle-free for the most efficient supply chain possible. Slide 4: Traditional communication is manual and costly. The traditional ways that trading partners communicate business information is manual and costly. Phone calls, emails, and manual verification sap untold man-hours every day from suppliers, decorators, and distributors alike. It’s a time-intensive back-and-forth, repeated transaction after transaction, day after day. A distributor might call a supplier to ask about price and availability. Now a supplier representative needs to spend time answering that call, looking up the information, hopefully finding it quickly, then providing the answer. Later in the order lifecycle, the distributor might email to ask about the order status. Again, it’s going to require supplier man-hours to find and deliver an answer. Now later in the transaction, it’s the supplier reaching out to the distributor. The supplier is reaching out by phone or email or in some manual way to handle payment. Again -- It’s a time-intensive back-and-forth, repeated transaction after transaction, day after day. And over the course of dozens, hundreds, or even thousands of transactions per day, all those man-hours add up into significant costs for both trading partners – the supplier and distributor alike. All that time and money spent communicating, re-communicating, and correcting business information is what we call Supply Chain Friction. It’s the avoidable time, labor, and costs that get built into every order through inefficient communication. Systems Integration is the solution to Supply Chain Friction. Rather than all those calls and emails that take so much time and labor, imagine having the information automatically shared in real-time among the people who need it. The result is instant, hassle-free visibility to the accurate, real-time information that’s needed to do business. Integration allows the automated exchange of information that costs the most time and labor to communicate. Integration creates a supply chain without Supply Chain Friction. Here to bring you a closer look is your presenter, Marco Peña. Marco is a Business Development Manager for Essent, specializing in integration. And he’s also a specialist in the promotional products industry. He’s going to tell you more about how integration eliminates Supply Chain Friction for more efficient business partnerships. Thank you very, much Doug. I think a good way to start the webinar today is to get everyone on the same page just by saying briefly what integration is. The technical specifications of integration are complicated. But just think of it like a dial tone. You pick up the phone, you hear the dial tone, and you know that the phone will reliably deliver your message. With systems integration, it’s like software systems calling one another to automatically provide real-time information. It’s important to note that trading partners don’t have to change their ERPs or Business Management Systems to integrate. Both partners can continue using what they’re using. The integration handles the communication between systems -- even when they’re different systems using different data formats. Once the integration is built, the software systems automatically exchange information. Then the trading partners using those systems can see the information in their own ERP or Web Portal. With integration, trading partners can communicate business information automatically, accurately, and in real-time. It doesn’t require any manual processes. For example, a buyer can simply look up price and availability within their own ERP or web portal. No phone calls or emails are required. The result is instant, hassle-free visibility to the information that’s needed for every transaction. The information that can be integrated is naturally the information that’s most often required for business. It’s the information that trading partners spend the most time exchanging manually. It includes pricing and availability. Product catalogs. Product configuration, such as where and how an item can be imprinted. And order status. Trading partners can also integrate Purchase Orders. Shipping Notices Invoices. And more. If trading partners have information they want to share through integration, chances are there’s a way to integrate it. One way to understand the value of integration is to understand the value of the partnership between a supplier and a distributor. The supplier and distributor are in a partnership to satisfy the end buyer. The better the partnership functions, the more the supplier and distributor both can gain from it. The supplier and distributor want a friction-free relationship. In other words, the more efficient the better. The efficiency of integration is going to streamline processes and activities. For one, it will cut out all those phone calls and emails that Doug mentioned. The information will also be more accurate. Since the information isn’t being relayed manually, there will be less opportunity to create time-intensive errors. Now the supplier and distributor both have more time for more productive activities, like sales. And now that both parties are empowered to sell more, consumption will go up, which is what everyone wants. One of the best ways to illustrate the value of efficient business information is to look at the opposite – flawed business information. The inefficient exchange of business information leads to flawed, inefficient orders. It’s not just the time or labor associated with communicating the information by phone or email. It’s the manual steps that introduce errors that take even more time to fix. Sometimes poorly formed orders are just incomplete. Required information missing. Or it could just be a free-form order. It doesn’t really follow any of the rules for efficient information. This type of supply chain friction is costly. One large supplier told PPB magazine that it costs $13,000 per day to process flawed orders. And that’s in addition to what it costs to process the good orders. With a typical 5-day work week, there are 261 business days in a year. Do the math, and the cost of inefficient information is $3.4 million per year for just that one supplier. And again, that’s what we mean when we say Supply Chain Friction. It’s the avoidable time, labor, and costs that get built into every order through inefficient communication. So what happens with that Supply Chain Friction? It naturally gets baked into unit prices. So your hat or pen or T-shirt is more expensive now. Then it gets passed onto the distributor. And as the product moves through the supply chain, the Supply Chain Friction sticks with it. Now the distributor is going to the end buyer with these extra costs built in. The distributor can simply pass along the cost to the end buyer. But the end buyer isn’t going to like throwing money away. It’s going to lead to customer dissatisfaction and possibly lost business. The distributor can also simply absorb the supply chain friction. So now the distributor can take a lesser margin to keep the end buyer happy. So what are you left with? Either an end buyer unhappily throwing away money. Or a distributor with diminished margins. There’s no good outcome. So that’s why the relationship between the supplier and distributor is so important. The costs for the supplier, the costs for the distributor, and the satisfaction for the end customer all depend on that relationship. The more efficient their partnership, the better it is for everyone. Systems Integration provides at least three major advantages that make a better relationship. Integration makes it easier for buyers to buy. Integration greatly reduces the time and labor associated with each transaction. Integration enhances customer service. Suppliers want to integrate so that buyers immediately have the information they need to buy. One concept to keep in mind is the Zero Moment of Truth. The term describes the instant when the buyer has a need. Let’s say the distributor has a client with a large rush order. Or any order for that matter. A supplier who can immediately show the distributor what’s available for what price has a far greater chance of selling it. So the supplier who integrates price and availability information has a huge advantage. The distributor is also going to need to configure the product. Where and how the order is going to be decorated, for example. Product configuration integrations allow the buyer to choose imprint locations, methods, and otherwise configure the product according to business rules set by the supplier. By integrating price, availability, and configuration, the supplier seamlessly provides the information needed to move the transaction forward. The supplier and distributor have numerous occasions to communicate through the order lifecycle. The more efficiently those communications are carried out, the more efficient the transaction. The end user will be better served and costs will be contained. We just illustrated the ways integration provides instant price, availability, and configuration before the transaction. And the integration can continue providing efficiency throughout the order lifecycle. While the transaction is in process, order status and shipping notice integrations provide updates from the supplier to the distributor. This is the information incidentally that the end buyer most frequently wants to know from the distributor. At the end of the order lifecycle, integrations for invoices and payment information make payment easy. 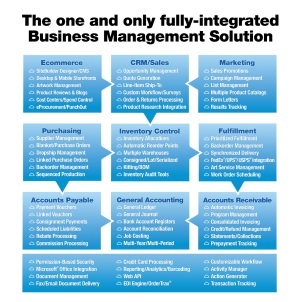 Integration automatically provides the information that suppliers used to spend the most time providing manually. Now everyone is freed up for more productive activities, like sales. And one more big advantage of integration is enhanced customer service. Distributors, and ultimately end buyers, have easier access to the information needed to place, manage, and complete orders. From quoting all the way out to invoicing, the information needed for the order lifecycle is automatically provided. Distributors now have the ability to gather the business information more efficiently than they could through the traditional, manual methods. With time-intensive manual tasks stripped from the order lifecycle, orders reach the production floor and, ultimately, the end customer faster. With integration, it's easier and quicker for suppliers to satisfy distributors, who in turn can more easily and quickly satisfy end customers. It's a boost in customer service throughout the supply chain. So how does integration work in the real world? Here are some promotional products companies leveraging integration right now. EmbroidMe is a promotional products distributor with more than 500 franchise locations worldwide. It recently launched the EmbroidMe Supplier Integration Initiative. The initiative directs 145 suppliers to integrate with EmbroidMe through the Essent OrderTrax Network. The first phase of the project is to integrate inventory information. So EmbroidMe stores will have instant access to price and availability from suppliers. In later phases of the initiative, EmbroidMe will encourage suppliers to integrate Product Catalogs, Product Configurations, Purchase Orders, Order Statuses, Advance Ship Notices, and Invoices. The goal is to provide EmbroidMe stores with immediate, real-time access to the supplier information needed to do business. Beacon Promotions is a promotional products supplier with more than a dozen awards for its customer service. Beacon is using an Inventory Availability Web Service. The web service is built to PromoStandards specifications and runs via the Essent OrderTrax Network to provide price and availability information. Once Beacon had the integration built, the hard part was done. It could then simply invite distributors to join the integration. Six of Beacon’s biggest distributor partners immediately joined, and Beacon is looking for more distributors to integrate. Beacon reports that the need for those distributors to call or email for information is virtually eliminated and that those distributors instantly have the information they need to make a purchase. Beacon says the integration enhances its award winning customer service. MARCO Promotional Products, a distributor, and Hub Pen Company, a supplier, are integrated in a way that takes almost all of the manual work out of order processing. They use Automated Order Processing. You might have heard it by its nickname in the promotional products industry, ‘The Holy Grail.’ It’s a solution that was recognized with a PPAI Technology Summit Internal Innovator Award. Automated Order Processing is a combination of integrations, most prominently purchase orders and product configurations. By defining the information required for a purchase order and configuration, the companies are virtually assured of exchanging accurate order information every time. The accuracy of the information results in Well-Formed orders. Because they are complete and accurate, these orders can be processed by computers without requiring a person to look at them. The orders reach the production floor in half the time. And it doesn’t require nearly the time and labor required in manual order processing. Suppliers and distributors can develop their own integrations with in-house staff. But most companies ultimately find it preferable to use an experienced integration services provider, like Essent. Here are five reasons why. The first is reduced maintenance. Maintenance costs like bug fixes, updates, and security compliance can amount of tens of thousands of dollars per year. Maintenance quickly becomes more costly than the upfront cost. But with an integration provider, the maintenance costs are shared by multiple companies so no one has to shoulder the burden themselves. Second is scalability. An integration provider has infrastructure that typically provides much more scalability than individual companies can provide on their own. The provider can add server capacity for peak events, and subtract it when it’s no longer needed. And it can handle new integrations with new partners as they arise. Next is cost stability. Costs for hardware, labor, maintenance and licensing can fluctuate. But an integration provider typically handles all of that for one flat monthly fee. New security threats and standards emerge every day and it’s an around-the-clock job to manage. An integration provider typically provides around-the-clock security as part of a subscription. Companies can let the provider sweat security. And finally, there’s experience. Even companies with developers are unlikely to have the extensive integration experience offered by integration providers. Integration providers have already identified and solved many of the issues. Essent integrations leverage the Essent OrderTrax Network. OrderTrax is the promotional products industry-standard commerce network. It processes more than 12 million transactions annually. Those transactions represent $3 billion annually. And it allows trading partners to automatically exchange business information in real time. Here is perhaps the greatest advantage of integrating through an established network, like the OrderTrax Network. When using adopted protocols, the majority of the work is done once. Hundreds of companies -- including promotional products industry distributors, decorators, and suppliers -- are already in the Network. So once you’re in the OrderTrax Network, you’ve just adopted hundreds of potential integration partners. And it’s easy to turn on integrations with others in the Network. This is a big advantage for a number of reasons. For starters, companies don’t need to create a new integration every time they want to add a trading partner. Creating a new integration each time quickly becomes costly. But OrderTrax delivers a built-in network of potential integration partners. With so many companies in the network, Essent is able to perform matchmaking services. Essent can help companies find integration partners who are already in the network and therefore set up to integrate quickly, simply, and cost-effectively. Inclusion in the Essent OrderTrax Network means that once you integrate, Essent can handle the rest. From maintenance to security to matchmaking, the Essent OrderTrax Network opens the door to hundreds of potential trading partners. And with that I’m going to turn it back over to Doug, who will tell you how to learn more. Essent is dedicated to creating efficiency in the promotional products industry and supports all of the capabilities discussed today. Essent has integration solutions for every step of the order lifecycle for enhanced supplier-distributor relationships and a more efficient supply chain. To learn more about integration, you can visit Essent.com/Integration. There you can find more about everything we discussed today, and also get in touch with an Essent representative for a free consultation. Again, that’s Essent.com/Integration to learn more. Thanks again to everyone for attending today’s webinar. Make a more efficient supply chain with systems integration.